In honor of our losing to the Germans but advancing to the Knockout Stage of the World Cup, I thought I’d share a little Louisiana-German culinary history today. When you think of Cabbage and sauerkraut, I bet the first culinary culture you think of is Germany. Definitely not Louisiana Cajun culture. BUT since Louisiana has been a great melting pot of cultures over the last 300 years, a German cultural identity managed to establish itself on the German Coast (Cote des Allemands) in the early to mid-1700s. The Germans brought their blue-collar work ethic, farming traditions, and of course their culinary heritage with them. In fact, the modern day andouille that we love to eat so much in our dishes here originated with the Germans on the German Coast. Many of the traditional German dishes have filtered into our menus at The Cabin Restuarant and the Coffee House in The Cajun Village, like cabbage, for instance. “Cabbage was widely grown in Europe and on the German Coast. Most of the cabbage was turned into sauerkraut. My mother had a 12 gallon earthenware crock in which she made the sauerkraut. to overﬂow the lid she added brine as necessary. 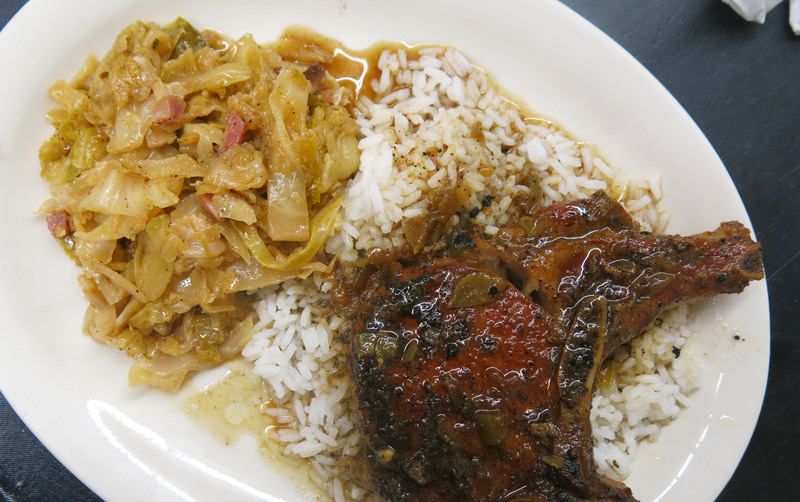 At The Cabin and the Coffee, we like to serve our cabbage sautéed with a smothered pork chop over rice (picture above). You’ll have to come give it a try sometime, or try the traditional way of making sauerkraut yourself! I do not like tinned sauerkraut, so thanks for the recipe. The only and the best sauerkraut has to be home cooked.